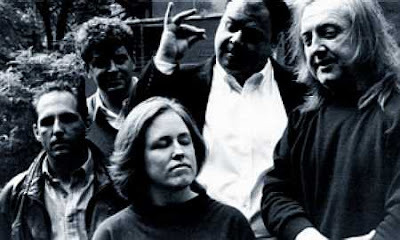 Pere Ubu, with guitarist Jim Jones on the right. I just learned that Jim Jones -- a prominent Cleveland-based musician who played with Pere Ubu, the Easter Monkeys and The Mirrors -- died last Monday night, February 18, at age 57. This obit article from the Cleveland PLAIN DEALER, which includes commentary from PSYCHOTRONIC editor Michael Weldon (another Mirrors alumnus) renders a sketch of someone I would have liked very much to know more than musically. As I've mentioned here before, I once had the pleasure of seeing Pere Ubu live at Bogart's here in Cincinnati when the group reformed in the 1980s. Jones, a former roadie for the band, had replaced Red Crayola guitarist Mayo Thompson in the lineup at the time, and I remember him playing a hell of a lead on "Thirty Seconds Over Tokyo," the kind that should require a guitarist to wear a welder's mask as it sprays sparks all over the stage. The show attracted a small turnout but I was front and center for it with a huge smile plastered all over my face -- close enough for bassist Tom Maimone to return it more than once. Fifty-seven is much too young a demise, but Jim was blessed to go the way we probably all of us want to go -- not seeing it coming, while happily engaged in conversation with a friend about stuff.